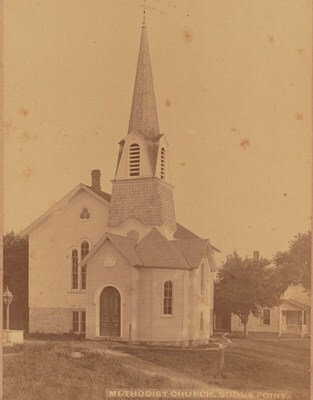 May 2, 1871, John H. Wood and his wife, Jane, sold the present church land lying south of the Public Square to the Trustees of the First Society of the Methodist Episcopal Church of Sodus Point for $300.00. Soon after the land was purchased, the building of the Church began. The corner stone was laid August 3, 1871. 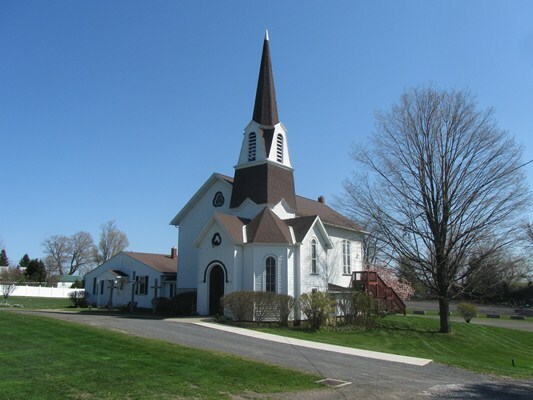 The Church was build by Charles Hill (1839-1898) a contractor and builder who lived in Sodus Point. The cost was $4000. The stained glass windows were placed during 1928-1929 in memory of founding families of the church. They were dedicated in May of 1930. ( They really should be seen from inside so hope you will come to the church some Sunday !) The present bell was placed in 1912. It weighs 738 pounds and cost $410. The old bell was cracked but was traded in for $139.88. Provision was made to make sure that a key for the church was placed outside so anyone could get in to ring the bell in case of fire. The photo of the old church is courtesty of Glenn Proseus and the write-up is from the 1974 Sodus Point Walking Tour.